Among the performance arts, which are visible for public display and performance during traditional weddings and other kinds of celebrations, the most elaborate element is a performance art known as Kujenga. The term “ku-jenga” translates as “to compose”, but the translation doesn’t do justice to the elaborate art which in its performance articulates the entire range of Songora history, social values and practices. During Kujenga performance one male singer [Omu-jengyi] will lead with a song and chants, while three or four other men will make low and high, steady continuous notes, including alternating rumbling, droning, yodelling sounds or cries. The performance is entirely vocal and there are no instruments involved, except for occasional clapping and foot-stamping by performers when the rhythmic tempo calls for it. The audience responds rhythmically to the performance by clapping. At the climax of the “Kijengo” session, one performer, or a member of the audience, will take centre stage and perform a spirited recitation of Engabu. The Engabu is a poetic rendition usually done rhythmically and rapidly - but not always. Traditionally performers were not interrupted when reciting these poems - some can be quite long and can last an hour. However, the audience might call out encouragement during the short pauses between the poem stanzas without breaking the flow of the rendition. The performance of Kujenga requires the most complex vocal skills, and involves all other Songora vocal art forms - but especially Ku-Ebuga - the traditional Songora style of poetic declamation that is generally rapid but graceful. The most distinctive sound in Kujenga consists in singing several varying notes to one vowel or syllable. Several singers cry out these varying notes together to achieve a profuse but harmonious cadence. The vocalizations are sometimes plaintive or melancholy expressing great sorrow or distress, sometimes exuberant and high-spirited expressing euphoria, sometimes restrained but rich in timbre. Kujenga is a quite elaborate form of lively vocal composition unique to the Basongora. Although the performances of Kujenga are structured in form, the compositions are improvisations descriptive of the struggles, the aesthetics, and aspirations of the Basongora people. The performance sessions involve a display of a wide range of taxing vocal and memory skills. Persons who are accomplished at the art of Kujenga almost inevitably are known for their exceptional language abilities as well as for the important role they play as community historians and genealogists. The role played by “AbaJengyi” - those who perform Kujenga - is akin to the role of the Griot in west African society. Like the griots, “AbaJengyi” constitute a respected class of traveling poets, musicians, and storytellers whose work was to maintain the traditions of oral history in Busongora. One of the leading Kujenga performers in Busongora is Mr. James Bwebale. He has served as Minister of Culture for Busongora Kingdom, and is one of the people responsible for restoration of the kingdom in 2012. Bwebale is a much sought-after speaker and performer at social functions because of the wealth of cultural detail and genealogical information he is able to muster and to deploy at these occasions. Community members seek him out when they need to learn about their ancestral relationship with neighbours or potential spouses. The Kujenga compositions are performed whenever the Basongora meet in gatherings to celebrate an event. Kujenga performances and compositions take place during weddings and other events, and at palaces to praise the monarch and the heroes of the kingdom. The etiquette and decorum required of performers of Kujenga is highly and elaborately developed. When performing “Kujenga” the singers sit on chairs [entebe] or on rounded wooden stools [ebikaransi]. Male Basongora performers may also squat on the ground, if there are no seats available. 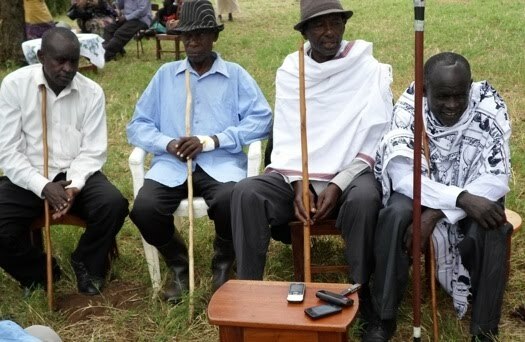 The men wrap sheets or shawls [butambi/eminagiro] over their shoulders, and they hold herders sticks [emyigo]. Sheets of cloths [emitanda] associated with Kujenga are the normal dress of the Basongora. The emitanda are simply sheets of cloth which men wrap around the waist to cover their lower body, and also about the shoulders. Herders’ sticks, are also normally part of the accessories used by Basongora men, and are carried at all times. Sticks are used for supporting a person’s weight, for self-defence, and for display during performances. Each one of the sticks is also usually distinctive, and an entire art exists for the manufacture, maintenance and use of these sticks. Even unadorned sticks are usually rubbed down and smoothened over the course of many years so that they acquire a lustre and are quite attractive. The quality of a man’s stick is used for display of status and skill. Men may spend hours discussing the qualities of their sticks - the weight of the stick, what species of tree the stick is made from, and what adventures they went through to obtain the stick. Incidentally the culture of using sticks means Basongora tend to have a great amount of botanical knowledge. In fact the sticks are so highly valued among Basongora that if a man give you a stick as a gift, you are supposed to give him back a cow in exchange. If a man sent you on an important errand or message to deliver to another person far away, he might give you his stick to present as proof that the message is authentic. Sticks functioned in many ways as an identification device and still do in some ways. Today if a man is walking with a herders stick in the middle of a city in Uganda, he is immediately identified as a member of the Songora or Huma community. Sticks are one of the accessory means that Basongora have of self-identification when in public. Kujenga involves reciting historical events, e.g., the Kijengo of the 1875 Battle of Rukooki” describes the causes and course of the war between Busongora and Bunyoro, and names and praises the commanders and the heroes of that war. At the very least Kujenga songs now in existence deal with events that are over a hundred years old. Certainly Basongora alive today found the art form fully developed and can attest to the fact that their grand parents were practising Kujenga when those that are now nearing 100 years old were only infants. Most of the material and events which are spoken about and recited in the Kujenga performances took place in the 1940s or earlier, and very few new compositions are being made because there are few new composers. The practice of Kujenga is at risk of disappearing. There are less than ten  persons in Busongora who are skilled at Kujenga. The tradition bearers are elderly people and most of the young people are indifferent or not interested in learning. The present context is not conducive to transmission of Kujenga because many people are preoccupied by social and economic survival requirements that are not favourable to the enactment of Kujenga. The performance of Kujenga faces threats such as: the loss of accomplished and skilled performers from the old generation due to old age and other causes of a high death rate prevalent in the region - including war, displacement and disease; many Basongora have been displaced and live in isolation from each other, and so are unable to properly and regularly perform Kujenga which is a communal practice; the introduction of religious beliefs that belittle the traditional norms of the Basongora. However, Kujenga is still valued by the Basongora and is a very important part of their social and cultural practices. Besides, the community efforts, civil society organizations, government of Uganda, and individuals, have all contributed towards safeguarding efforts by encouraging performances, and by engaging both print and electronic media. The growth of cultural tourism is also encouraging the practice of Kujenga. Kujenga as an art form deals with the same ideas and topics as are staple of of another art form of the Basongora known as Kugana. However, whereas the Kujenga is a musical art form, the Kugana art form consists mostly of speech and story-telling.